If you have an international business, or if your customers come from different time zones, this article will prove to be highly valuable. I’m going to show you how to find the exact hour when your clients are buying from you. What’s the deal, you might say? You can easily see this by looking inside Google Analytics Time reports. Anyone can do it, right? Well, not really. You see, the problem with that particular report is that it will always show you the time configured inside your Google Analytics settings. So if you see 10 AM, it’s 10 in the morning, your Google Analytics time. This can be just fine if most of your customers are on the same time zone as your Google account, but if that’s not the case, you’re having a little problem. Don’t worry, the solution is rather simple, and I’m going to show it to you in a moment. You just need to have Google Analytics implemented by PixelYourSite Pro. This strategy is not limited to WooCommerce or Easy Digital Downloads transactions, but you can be used for ANY type of interactions. PixelYourSite will add the required data to all your events. There are various ways to use this piece of data. If you run a newsletter, chances are that you can configure your messages to be sent at a particular hour, depending on the user’s time zone. We, at PixelYourSite, use ActiveCampaing and we can easily configure our automatic emails to run at the exact reader’s time (you should get this very email at about 10 AM). If you run Facebook Ads you can configure some of them to be delivered between particular hourly intervals only. Other advertising platforms might give similar options too. You can come up with well-targeted expiring ours for your promotions. Maybe closing a promotion at midnight is less profitable than closing it at 5 PM, if that’s an hour when your visitors convert the most. In order for this strategy to work you need to run PixelYourSite Pro, starting version 7.0. The plugin will automatically send your visitors’ browser time for all the captured events. This means that you can find the real time for every kind of interaction, not just WooCommerce or Easy Digital Downloads transaction. This info will be sent as Custom Dimensions. This is a one time only step. Once the custom dimensions configured, they will be available for all your Google Analytics reports. I’m just going to give you an example here using the Purchase event. Let’s say you run a WooCommerce store and you want to find at what time your clients are buying. PixelYourSite will automatically fire a Purchase event when a transaction takes place (it’s part of our complex Google Analytics Enhanced Ecommerce integration). This is the event you need to track the time for. 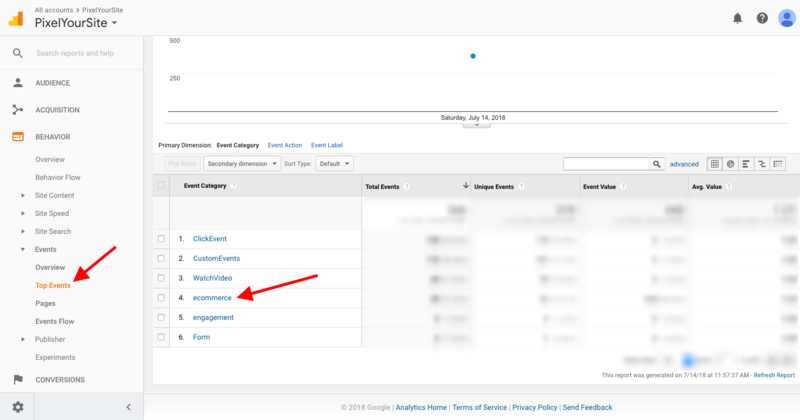 Open your Google Analytics account and click on BEHAVIOUR, then Top Event and “ecommerce”. Click on “purchase” and then on the Secondary Dimension selector. Select Custom Dimension, Hour. Order the results by “Total Events”. You will see now the hour interval when the events re fired. It’s easy to observe that in this particular report most transactions take place between 15-16 followed by the 17-18 interval. Another good time for conversion seems to be in the morning, between 11 and 12. Giving this data, I should probably configure my offers to reach the readers’ inboxes between 15 and 18, but also test the 11 to 12 interval. TIP: If you’re using PixelYourSite Pro, configure the Custom Dimension right away. This will ensure that your clients’ browser time is recorded and will be ready and available when you’re going to need it.